This 550-pound icon discusses living in Pike Place Market, her place in Seattle history, and what it’s like to bring home the bacon. 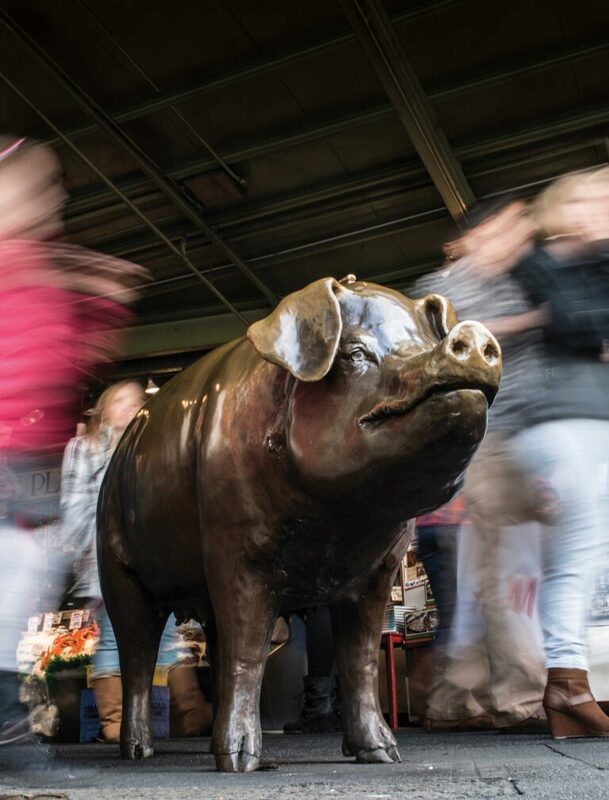 How does it feel to be the most famous pig in Seattle? Oh, stop. You’re making me blush beneath my bronze. Ever since I was installed in 1986 below Pike Place Market’s (*First Ave and Pike St; pikeplacemarket.org) neon clock sign, it’s been a nonstop lovefest. I couldn’t be prouder to be the market’s unofficial mascot (pikeplacemarket.org/rachel-piggy-bank). My day starts around 6am, when the market opens for business. I like to make sure the sign is shining and that the fishmongers at Pike Place Fish Market (86 Pike Pl; pikeplacefish.com) have their throwing arms warmed up. From there it’s go, go, go. I pose for pictures, I let kids ride on my back, I ask people to rub my snout for good luck, and—of course—I collect donations for the market’s social services fund, Pike Place Market Foundation (pikeplacemarketfoundation.org). How much have you collected? About $15,000 every year—and all of it goes to the market’s low-income housing, food bank, and senior center. I’ve received everything from pennies to dollar bills, even Japanese yen! Every little bit counts. What should visitors do at Pike Place Market? Walk around the Corner and Sanitary Market buildings to see the fresh fruit, vegetables, and seafood. Of course, feel free to enjoy a sample or two. I’d also suggest visiting my cousin Billie at the MarketFront. It’s a historic expansion—the first in 40 years—and has so many great craft vendors and a beautiful plaza that looks out onto Elliott Bay. Relax with a beer at Old Stove Brewing Co (*1537 Western Ave; oldstove.com) or pick up a cheddar cheese roll from Piroshky Piroshky (1908 Pike Pl; piroshkybakery.com). And definitely make time to stop and enjoy the music from the market’s buskers.